Joel Gregory tells the story of a family seated around their table one Thanksgiving Day looking at the annual holiday bird. From the oldest to the youngest, they were to express their praise. 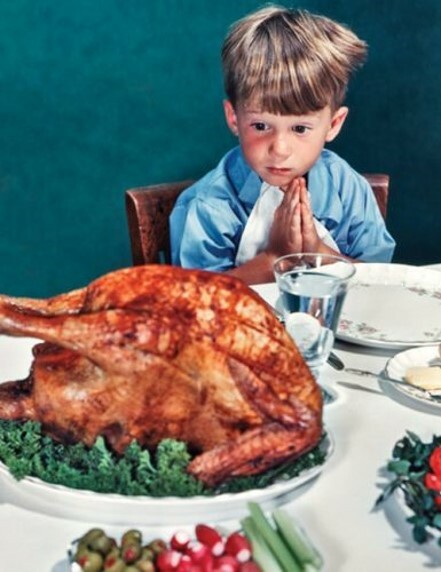 When they came to the 5-year-old in the family, he began by looking at the turkey and expressing his thanks to the turkey, saying although he had not tasted it he knew it would be good. After that rather novel expression of thanksgiving, he began with a more predictable line of credits, thanking his mother for cooking the turkey and his father for buying the turkey. But then he went beyond that. He joined together a whole hidden multitude of benefactors, linking them with cause and effect. It is often easy to look at our good fortune and the abundance of our blessings as a result of our superior intelligence, hard work, business acumen, physical prowess, or educational accomplishments. Or like the little boy, credit everyone else for our success and forget about God. “Give thanks unto the Lord” for your material blessings. On this Thanksgiving Day, most will enjoy a feast. Yet, every day we have plenty to eat. There is food in the pantry and refrigerator. And, if the cupboard is bare, the grocery store is not far away. In America, even the homeless have shelters that will provide Thanksgiving dinners for all who will come. “Give thanks unto the Lord” for your family and friends. We are blessed to be with our children and grandchildren this year. However, there have been times when that was not possible and we have enjoyed the hospitality of friends. Let’s not take for granted the relationships we enjoy. Nurture them. And thank God for them. “Give thanks unto the Lord” for the freedom we enjoy. Thanksgiving is a uniquely American holiday. While most countries have a day to celebrate their heritage, independence, or monarchy, only a few countries have set aside a day for national thanksgiving. We enjoy the freedom to express our faith. Freedom of speech. Freedom to pursue our dreams. “Give thanks unto the Lord” for your spiritual blessings. Whether secularists admit it or not our Thanksgiving has its roots in a religious heritage dating back to the Pilgrims who came to America seeking religious freedom. The Bible teaches us that God has provided all spiritual blessings “in Christ” (Eph 1:3). While Christians are reminded of that fact every Sunday, on this Thanksgiving Day, remember your spiritual blessings are more valuable than material, physical and national benefits. For all we have, to God be the glory.